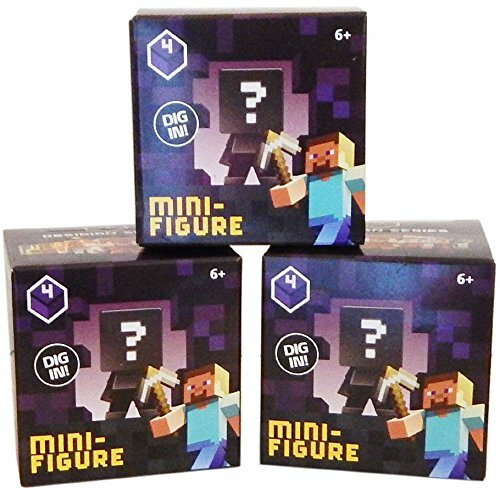 Mattel Minecraft series Obsidian mystery packs are perfect for the Minecraftfan in your life! Dig in to the world of Minecraft like never before! Buriedinside each 1-pack is a unique Minecraft Mini-Figure just waiting to bediscovered -- you never know which figure youll find next until you open thebox! Featuring the games signature, 8-bit style, these figures allow kids toplay with their favorite characters anywhere. So start exploring the world ofMinecraft Mini-Figures and craft the perfect collection! Includes 1 miniaturefigure. Colors and decorations may vary. Features: Now you can explore theworld of Minecraft like never before! Enclosed inside each blind pack is 1Minecraft Mini Figure that features the games signature appearance. Collectyour favorites and build out your Minecraft world!